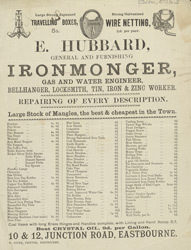 19th Century ironmongers, like E. Hubbard, were expected to know about almost everything to do with the home. They needed to know carpentry and pluming, be familiar with locks and tools and to understand how to fix a range of household appliances. Not only did he sell the goods but could tell the customers how to use them. Store windows would have been filled with tools, knives, nails and other pieces of metal and inside every shelf was packed with objects. Often large goods like dustbins or buckets had to be displayed on the street outside the door as there was no room for them inside the store.